Observations and insights on the global fight for economic freedom and prosperity. Jeffrey Sachs of Columbia University is a big booster of the discredited notion that foreign aid is a cure-all for poverty in the developing world, but he is now branching out and saying silly things about policy in other areas. In a column for the Financial Times, he complains that tax competition is forcing governments to “race to the bottom” with regards to tax rates. The answer, he wants us to believe, is some sort of global tax cartel. Sort of an “OPEC for politicians” that will facilitate the imposition of higher tax rates. Only international co-operation can now solve what is becoming a runaway social crisis in many high-income countries. …With capital globally mobile, moreover, governments are now in a race to the bottom with regard to corporate taxation and loopholes for personal taxation of high incomes. Each government aims to attract mobile capital by cutting taxes relative to others. …countries cannot act by themselves. Even the social democracies of northern Europe, with their balanced budgets and high tax rates, are increasingly being pulled into the vortex of tax cutting and the race to the bottom. …recent trends…require increased, not decreased, taxation of higher incomes, including corporate profits; and that tax and regulatory co-ordination across countries are vital to prevent a ruinous fiscal race to the bottom. If this overwrought rhetoric is true, it would mean that governments have been starved of revenue because of race-to-the-bottom tax cuts for evil corporations and sinister rich people. Well, it is true that tax competition over the past 30-plus years has resulted in lower tax rates. But do lower tax rates mean less tax revenue, as implied by Sachs’ analysis? At the risk of being impolite and shattering anyone’s illusions, let’s actually see what happened to the overall tax burden on both personal and corporate income. This chart, showing the average for industrialized nations, shows that Sachs and his ilk are wrong. Way wrong. Tax rates have come down, but the overall tax burden actually has increased. 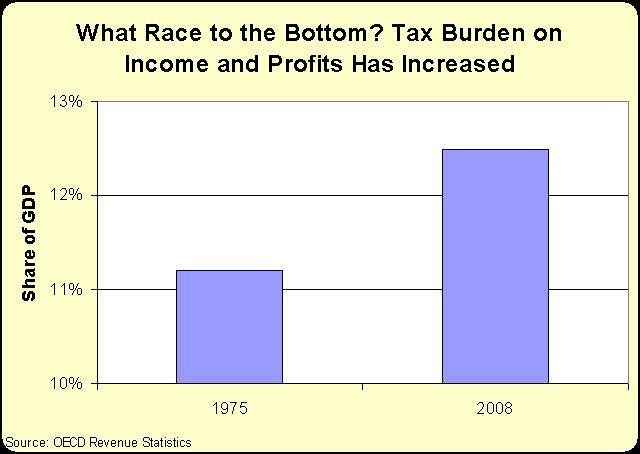 So while there may be a race to less-destructive tax rates, there certainly isn’t a race to bottom for tax revenue. Hmmm….lower tax rates and higher tax revenue. That seems vaguely familiar. Maybe it has something to do with “supply-side economics.” One can only wonder if Sachs has heard about that strange idea known as the Laffer Curve. The Market Center Blog Has Moved!